Have you ever dealt with discomfort caused by sitting? Most of us sit for hours each day as we practice, study, and use computers. I’ve observed, though, that few musicians know how to sit optimally, and, as a result, many endure frequent episodes of back pain. Here are 4 principles that contribute to optimal sitting. 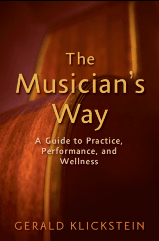 All are expanded on pages 250-269 of The Musician’s Way, where you’ll find additional guidelines as well as dozens of photos of different instrumentalists demonstrating favorable and unfavorable habits. a. Sit at the front edge of a standard-height, armless chair with only your pelvis contacting the seat. b. Place you feet flat on the floor. c. Position your knees hip-width to shoulder-width apart. Next, rock you pelvis forward and back to sense your two sitting bones. Then, cease rocking, and balance on the tips of those bones. Either remain at the front of the seat or slide back and distribute some of your weight on the backs of your thighs. Employ a seat cushion or lumbar support as desired. Positioning the hips higher than the knees helps release the lower back muscles and can facilitate breathing. Forward-sloping seat cushions are ideally suited to achieving this sort of hip alignment (I’m sitting on one as I write this). 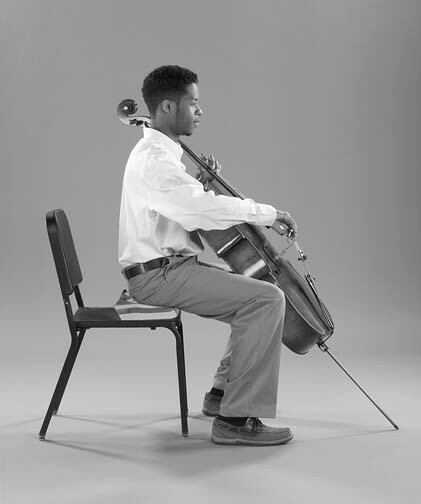 For taller musicians, chairs can also be modified in a pinch with the likes of thick phone books, as demonstrated by cellist Kendall Ramseur in the above image. To enable unbridled use of the arms, for starters, place your hands on your thighs and allow your shoulders to release down and away from each other (the shoulder blades will move closer together). Then, let your shoulders remain free as you make music or do any activity. Shoulders can be tricky to coordinate because they’re our most mobile joint. Many instrumentalists, for instance, tend to stiffen one or both shoulders as they bring their hands into playing position. So, in addition to adopting good shoulder use, take regular breaks during which you roll your shoulders, circle your arms, and otherwise counteract any buildup of tension. Pages 75-82 of The Musician’s Way present instructions and photos to incorporate six such restorative movements into our practice breaks. Avoid slumping forward or arching your back like a soldier at attention. To evaluate your spinal alignment, place a mirror or camera at your side; it’s also useful to ask a knowledgeable teacher or colleague for feedback. Along with applying the above four principles, most of us can discover optimal ways to sit by taking lessons in the Alexander technique or Feldenkrais method. It also helps for us to have adequate strength in the abdominal and back muscles. If you feel that your strength might be lacking, consider seeing an athletic trainer or a physical therapist for advice about exercises, but bear in mind that strength alone won’t suffice; optimal sitting habits are crucial. Well said, Susan – thanks for contributing. As I wrote above, one aim of balanced, easeful sitting is to “let yourself be available to move as opposed to holding yourself rigidly.” So, like you, I advocate an approach that incorporates micromovements and flexibility in sitting. I’m also a proponent of body mapping, Alexander technique, Feldenkrais, and other movement-awareness traditions that equip musicians to perform optimally and steer clear of playing-related injuries. Glad to hear that you’re back playing again! I agree. There’s a lot more than one right way to sit. Good, supported movement gets easily confused with posture. Our mothers and teachers were well-intentioned, but when they told us to “sit up straight” we got the wrong message – directing us towards something rigid, uncomfortable, and hard to maintain. What we need is to understand how our bony structure actually supports us. I’m not talking huge, dramatic, roll all over the stage movement. I’m talking the micro movements that happen when your instrument playing arms and fingers are dynamically supported by your spine, your sit bones, your feet, your breathing. I’m talking fluid, organized movement. I’m talking movements that feel good and deliver. Piano playing injuries rendered me silent until I finally found my way to this kind of movement. I studied Body Mapping, developed by Barbara Conable to “put musicians on a secure somatic foundation.” The work is based on the principles of Alexander Technique. It’s been my path to reclaiming my musical identity. The certifying organization is called Andover Educators, and you’ll find our website at bodymap.org. We teach “What Every Musician Needs to Know About the Body,” and you’ll find teachers all over the world. I think many student musicians are aware of the issue of sitting properly. I think where it gets hard to follow through with actually siting right is that no matter how properly you sit, you still get in pain from sitting the same way for many hours. I think having a few valid positions available would really help students. Just having one right way to sit only works for long.